Orcish weapons and heavy armor are made using the mineral Orichalcum with techniques developed by the Orcs. The armor is of medium-quality, but the weapons are relatively low-quality. 3 Orichalcum Ores are obtained by mining Orichalcum Ore Veins. Cannot be purchased. 1 Orichalcum Ingot is obtained by smelting 2 Orichalcum Ores. Can be purchased at all levels. Orcish Smithing requires 50 Smithing skill. 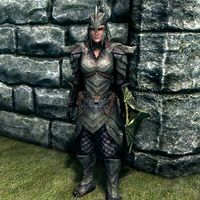 Orcish Armor is level 25 Heavy Armor, made from Orichalcum Ingots, Iron Ingots, and Leather Strips. Orcish weapons are level 6 weapons, made from Orichalcum Ingots, Iron Ingots, and Leather Strips. Orichalcum ingots may be sold by blacksmiths and general goods merchants at all levels. 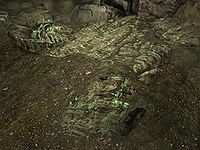 Orichalcum ore may be randomly found in Falmer loot starting at level 3. There are a total of 78 veins, 16 ores, and 12 ingots available in the game. Only locations containing multiple veins, ores, or ingots are included in the following list. The Orichalcum Veins category contains a more complete list of places containing single veins and all exterior ore veins are shown on (map). Orcish Smithing is the second perk in the heavy armor branch of the Smithing skill's perk tree. Unlocking it requires a Smithing skill of 50, and the Dwarven Smithing perk must have already been unlocked. Orcish Smithing allows both Orcish armor and Orcish weapons to be crafted. The Orcish Smithing perk also causes tempering of Orcish weapons and armor to be twice as effective. This perk applies to both unenchanted Orcish gear and enchanted gear (generic armor, generic weapons, or custom), as long as the Arcane Blacksmith perk has been unlocked. Tempering of a couple other items is also improved by Orcish Smithing, namely: Shagrol's Warhammer and The Longhammer. 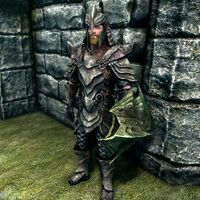 Orcish armor is a variety of heavy armor that is better than Dwarven and Steel Plate, but inferior to Ebony. It appears in leveled lists starting at level 25 (enchanted varieties at level 26). All items can be tempered using 1 Orichalcum Ingot, and having the Orcish Smithing perk doubles the quality improvement. Orcish weapons are relatively low-quality weapons, better than only Iron and Steel in quality. Notably, the weapons are lower quality than Dwarven weapons, even though Dwarven Smithing is a prerequisite for Orcish Smithing. They are lighter than Dwarven weapons, though. The weapons appear in leveled lists starting at level 6 (enchanted varieties at level 7) — with the exception of the Orcish Battleaxe which has been left out of the standard leveled lists, making it harder to find in random loot. All items except ammunition can be tempered using 1 Orichalcum Ingot, and having the Orcish Smithing perk doubles the quality improvement. Arrows can only be smithed if the Dawnguard add-on has been installed. † Orcish War Axes have a speed of 1 instead of 0.9. This bug also applies to all generic enchanted Orcish War Axes. ‡ The gold value of the Orcish Greatsword is half of what it should be (75 instead of 150). Enchanted variations use the proper base gold value of 150. Orichalcum (ore or ingot) is one of four items needed at the Atronach Forge to create a Staff of the Storm Atronach. Orichalcum Ore can be sold to Gharol or Shuftharz for the quest Mine Ore.
One special, quest-specific Orichalcum Ingot is part of the quest Hunt and Gather. 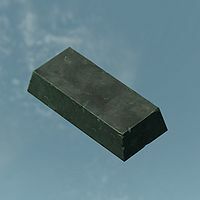 It has no uses -- it cannot be used in place of a standard ingot. This page was last modified on 14 September 2016, at 12:32.